5 Bedrooms, 2 Bathrooms, with Hot Tub, Mountain and Georgian Bay Views! Located at the base of Blue Mountain on an acre of land, our Southwestern Chalet at Blue Mountain is less than a 10 minute walk from the lifts at the Village at Blue Mountain in Collingwood. This lovingly restored, air-conditioned home boasts an open-concept format, with a very large living and dining room with a large screen TV and DVD player. Cozy around the gas fireplace with a glass of wine for good conversation with your guests! The renovated kitchen is fully equipped to accommodate large gatherings with modern appliances and room for more than one cook! Our wrap-around deck has a gas BBQ, beverage cooler and two six-seat patio sets with a stunning panoramic view of Blue Mountain. This chalet is capable of holding larger groups and provides a perfect backdrop for those memorable friends and family weekends. The main level rear deck is spacious with a new 8 person hot tub. Walk over to the firepit with seating for warming by the fire and roasting marshmallows. The newly renovated lower level boasts a super big screen TV with leather recliners and games table. The chalet accommodates up to 14 people with a total of 5 bedrooms; three on the main floor and two on the lower floor with two sizable, newly renovated bathrooms. Trails are available for a walk or bike ride through environmentally protected land, ravines and forest. Georgian Trail offers 32 kms of perfectly groomed scenic trail that winds along Hwy 26 from Collingwood to Meaford. It is also a two minute drive to the picturesque North Winds Beach, which is perfect for swimming, picnics, barbecues or just relaxing. It is an eight minute drive to the charming town of Collingwood and a fifteen minute drive to both Thornbury and Clarksburg and there are over ten golf courses in the surrounding area. We spent 4 days here at the tail end of March Break and it was wonderful. We had 7 kids (aged 4 to 13) and the set up was perfect. They were able to play, watch movies and sleep in the basement with all the bunkbeds. The basement bathroom was newly renovated and the shower was amazing! We took advantage of the hot tub and sauna which was nice after a full day of skiing. The main floor bathroom was fine (just not as nice as the newer one). We appreciated the large kitchen /living area so everyone could be together but doing their own things and the extended kitchen table allowed us all to eat together. The property was clean and maintained and the manager was very responsive to any questions we had that came up (couldn't find some of the light switches). We loved that it was so close to the BlueMountain village and south base (2-3 min drive and 10-15 min walk). The village had lots of great activities each day and the skiing after the snowfall Fri night was fantastic. Kids really enjoyed the ski school as it was their first time skiing and all the amenities were great. We will definately book again and recommend for a larger group with kids. Lovely customer service ! So helpful and accommodating! The place is beautiful and so close! I went for a bachelorette party and the large open concept space was perfect! We had an amazing time! Would highly recommend. We booked this property for my mother-in-law's 60th birthday celebration, and stayed as 3 couples + great dane + 4 month old. - Having to bring your own sheets, dish cloths and towels at this price point is not something I agree with. I had to bring a full sized suitcase for 2 nights to fit it all. We also paid the standard cleaning fee, but had to leave the place spotless as per the multi-page house rule doc, take the garbage down to the road for collection, and weren't provided any towels, sheets or dish cloths so ...we were a little confused what this cleaning cost actually covered. Overall - the experience was underwhelming (but thankfully we had a great crew, and hired a great private chef) and we will not rent this property again, given the lack of basic provisions and the property could use some serious TLC. For a bachelorette, though, where you`re just looking to pack people into a space - I could see that being more suited. You can’t please all the people all the time! We so wish we hadn’t worked so hard to make this visit work for these guests. We have had 5 stars just before and following. We worked with VRBO to address a booking system glitch so we could accept the reservation. They were thrilled to find an option of this size that was pet friendly at no additional charge. After booking she actually used the word beg for freebies and was fully aware of what was available at additional fees. When the requests were not met the sweet person turned angry was obviously seething for months as from the minute she arrivived she was looking for things to complain about sending continuous requests, complaints and pictures. We sent snow ploughs that had been working overtime to readdress the driveway late in the evening, we had a supply delivery early the next morning all at additional cost to us to ensure that the experience was good. We thanked her for the update on the cupboard which had been reported by the previous guest, repair was attempted but with back to back in peak season it was not fully addressed (we have since changed maintenance suppliers as we agree that standards should be high). The physical property meets licensing requirements. The fireplace referenced is an electric cosmetic feature and likely needed to be reset as the equipment is tested each visit. The toaster had not been reported. She of course did not compliment the many extras such as pancake maker, gas bbq, many kitchen utensils and gadgets, fire pit, furnace fireplace, reclining leather loungers, big screen TVs.The TV she was referring to was brand new, replaced expeditiously to ensure a nice experience in both entertainment areas. In peak season with back to back check-ins and outs the furniture does take a lot of wear and tear. The chairs were recently reupholstered but the backs are fragile which leaves them fully operational but subject to accidents. We refresh the property each spring and they will be on the list. Major issues are addressed immediately such as the TV. The new shower has 3 settings so if one setting was not comfortable there were 2 others to choose from. We even provided chef options, they chose their own. The review was petty, harsh and the experience of hosting disappointing. We appreciate the heads up for improvements which will be addressed. They are not welcome to return and we are thankful for the many repeat visitors who have loved us over the many years of improvements. The location was great, the house itself is beautiful and so cozy, and very clean! Our group of ten had a great weekend at the house. The huge porch is really nice. Unfortunately it was a super hot weekend so did not get to use the hot tub. The kitchen is well stocked and the great room is great for socializing. Holly and Colin were very responsive to emails. Only suggestion would be to have a book available with FAQs and good to know information (i.e. garbage rules, what to do on departure, food delivery options, etc). We've booked in Collingwood many times through this site and other rental sites. The places in Collingwood make every room into a bedroom and cram as many people into a unit as possible. This unit isn't like that. Yes, there are some bunk beds but there were more than enough individual room that only 2 people had to share a room out of 6 of us and they were proper bedrooms. There was a sitting area in the basement but the main draw was the living/dining/kitchen on the top floor. Great view, ample space, comfortable chairs and everything that you need. The hottub was a nice added touch too. We went up in late June 2018 and it rained Saturday and Sunday we were there but it didn't matter. There was more than enough space that we didn't feel cramped. We made it to the porch both days and no further. I'm also a stickler for a comfortable bed and these beds were comfortable. Not worn out, cheap, sagging hammock-like beds but proper mattresses. I slept great every night. Holly walked us through everything when we checked in and was more than pleasant from the initial inquiry to when we left. I actually left a bluetooth speaker behind by mistake and they brought it back down to Toronto and I met up to get it. Again, over-and-above than I expected. I would highly recommend this rental. Next time we go up, we will be renting this unit. Trail for a walk or bike ride through environmentally protected land, ravines and forest. Georgian Trail offers 32 kms of perfectly groomed scenic trail that winds along Hwy 26 from Collingwood to Meaford. Rates are based on 8 occupants. 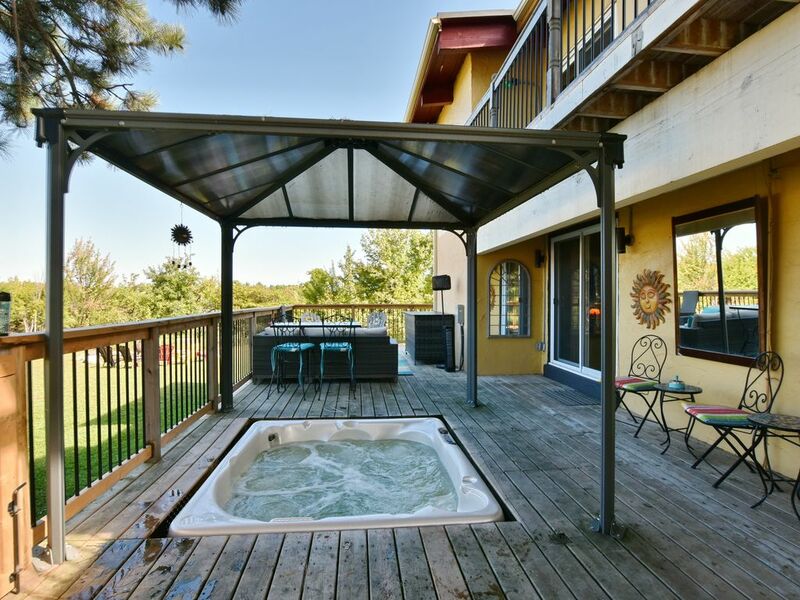 Add $75 per night for each additional occupant up to our max 14 No House Parties or outside visitors allowed. Do not move furniture or fixtures. Property must be left essentially in condition receive. Observance of Zero Tolerance Noise By-Laws governed by the Town of The Blue Mountains. Complaints can result in the tenant being issued a noise infraction violation ticket of $615 by the OPP and the landlord receiving demerit points and a $250 administrative penalty which will be deducted from the damage deposit.